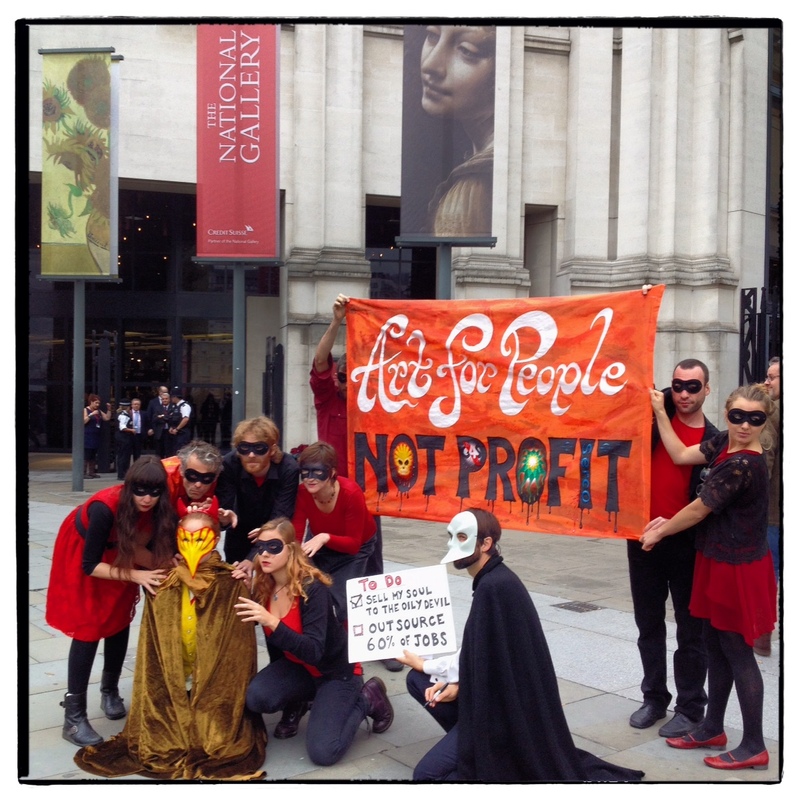 Musical anti-oil and privatisation protest disrupts launch of National Gallery exhibition – BP or not BP? Posted on October 14, 2014 by BP or not BP? 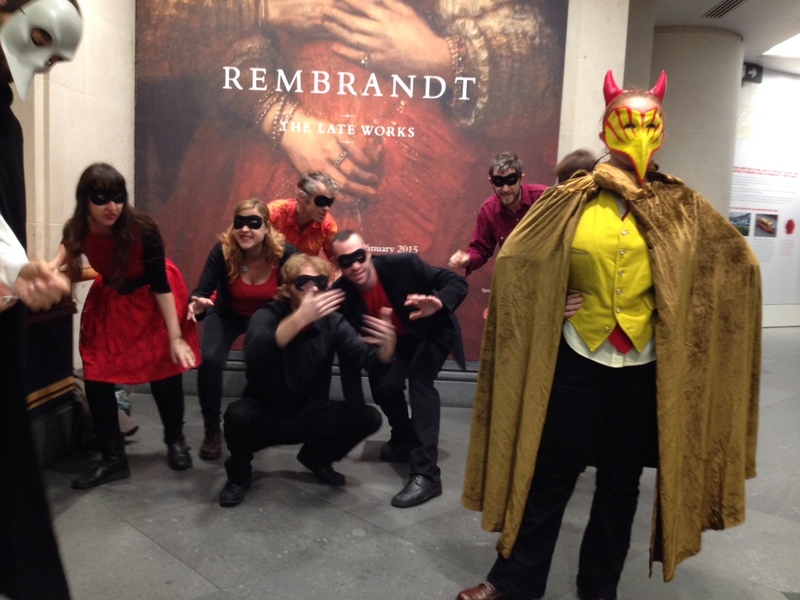 At 11.25 this morning, the official media launch of the National Gallery’s Shell-sponsored Rembrandt exhibition was interrupted by an unexpected musical protest. Ten performers launched into a energetic reworked musical version of “Dr Faustus” in front of surprised journalists, staff and gallery-goers. The performance featured a gallery director selling his soul to an oily, Shell-branded devil, and singing about his desire to outsource the majority of his staff. The new Rembrandt exhibition is sponsored by Shell, a company facing heavy criticism for its destructive extraction activities  and contribution to climate change . In addition, the exhibition will be entirely staffed by a private security firm rather than the Gallery’s own staff. Staff at the gallery are also facing the threat of large-scale privatisation which could see up to two-thirds of workers’ roles outsourced to private companies. The performance was accompanied by a banner reading “Art For People Not Profit”. The full script can be seen below. Security guards attempted to stop the singers but could not prevent the performance from happening. The performance finished with the singers symbolically casting the oily Shell-devil from the building and ripping up the privatisation plans. A police van arrived shortly after the protesters had left the building, but the police did not interfere. PCS Union members at the gallery will be part of a national civil servants’ strike tomorrow over pay, conditions, and privatisation of public services. On the same day, the Athabasca Chipewyan First Nation will be in court in Canada to challenge Shell’s legal right to expand their polluting tar sands operations on Indigenous land. Today’s performance was organised by the activist performance groups BP or not BP? and Shell Out Sounds, to show solidarity with the striking workers and also challenge the National Gallery’s relationship with the oil industry. There is increasing international pressure on public institutions to sever their ties with the fossil fuel industry. The rapidly-growing fossil fuel divestment movement has seen the World Council of Churches, the British Medical Association and even the Rockefeller Foundation pull their money out of the fossil fuel industry. Last week, Glasgow University became the first university in Europe to divest from fossil fuels, and Lego dropped Shell as a sponsor following a high-profile Greenpeace campaign. 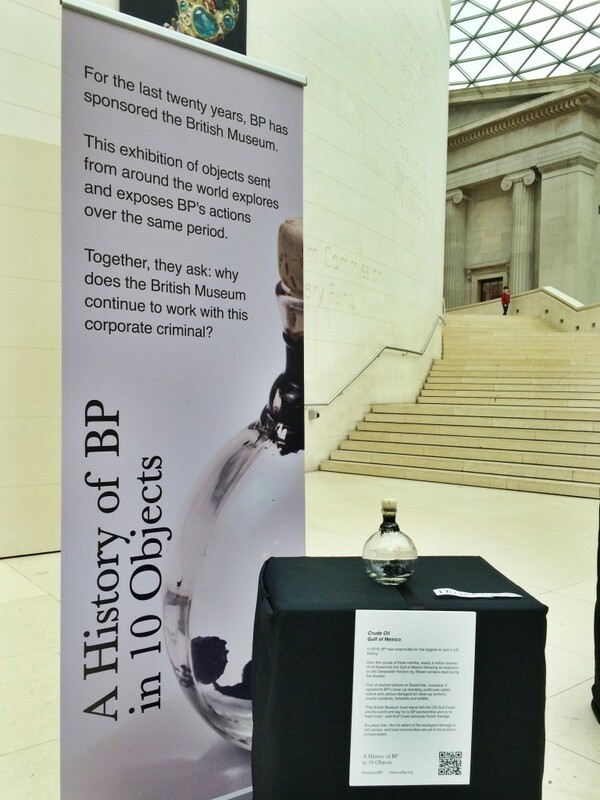 The Tate, the British Museum, the National Portrait Gallery, the Royal Opera House, and the Royal Shakespeare Company now face frequent protests over their sponsorship deal with BP, while the Southbank Centre ended its relationship with Shell earlier this year after pressure from artists and campaigners. BP or not BP? and Shell Out Sounds plan to return to the gallery on Thursday for a public protest outside Shell’s corporate “gala evening” for special guests and senior staff. Over 80 people have already pledged to attend the protest, which is being co-hosted by Art Not Oil, Shell Out Sounds, BP or not BP?, Platform, the UK Tar Sands Network, and Christian Climate Action. BP or not BP? and Shell Out Sounds are part of the Art Not Oil coalition, along with other groups seeking to kick oil sponsorship out of art and culture such as Liberate Tate, BP Out Of Opera, Platform, Science Unstained and London Rising Tide. To benefit the oil boss! [Gallery Director] “Corporate thieves, I have no doubt! Art funded by the public! Shell has operated in Nigeria for over 50 years and oil spills have become an almost daily occurrence in the oil region of the Niger Delta. A 2011 UN report confirmed the horrifying extent of pollution in the Ogoni region and estimated it could take 25 to 30 years to clean up. Shell is also one of the largest players in the tar sands in Canada, which are one of the most carbon-intensive and environmentally destructive sources of oil in the world, and has been the most aggressive company seeking to exploit the pristine Arctic Ocean for offshore oil. If an oil spill were to happen in the Arctic’s extreme, remote conditions, there is no proven method to clean it up. This proposed handover of national treasures to the care of such notoriously incompetent firms as SERCO and G4S is simply outrageous and must be stopped. I just saw your performance at the National Gallery staff exhibition at PCS. It was brilliant and most heartening to see such eloquent protest. Thank you. Pingback: USi | Reclaim the galleries!